Detect people moving up to 30 feet away, while ignoring small pets up to 40 pounds, with the Qolsys IQ Wireless S-Line Encrypted Pet Immune Motion Sensor (AKA the IQ Motion-S). 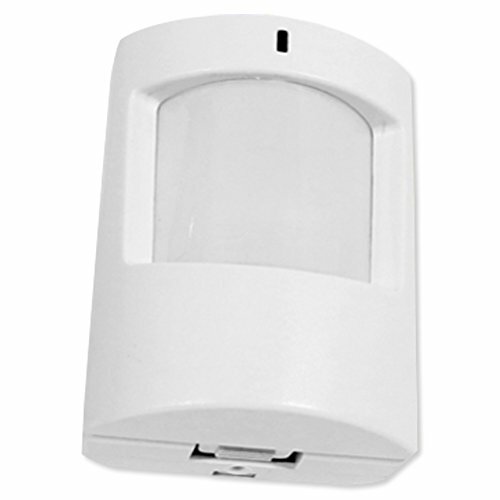 When motion is detected, this wireless battery-powered sensor sends a notification to your compatible control panel/receiver (319.5 MHz wireless frequency), such as a GE/Interlogix Panel (NetworX, Simon, etc.) or a Qolsys IQ Panel. The sensor can also be included in automation rules. For example, you could create a rule that turns on a light when someone enters the room. The sensor mounts at a variety of angles in a wall corner or on a shelf with the included hardware. FEATURES: Detects human motion up to 30 feet x 50 feet (80 degrees horizontally). Ignores pets up to 40 pounds to prevent false alarms. Compatible with 319.5 MHz wireless panels, such as GE/Interlogix or Qolsys IQ. Alerts for tamper, tamper restore, alarm, alarm restore, supervisory, low battery. Range up to 600 feet from panel. "S-Line" encryption protects signals. S-Line technology employs an advanced encryption scheme between the wireless sensor/device and the panel to ensure that wireless event transmissions are always unique, preventing and eliminating common replay attacks (when an unscrupulous person uses an easy-to-purchase software-defined radio or "listening device" to replay events previously sent by wireless devices paired with a security system.) CONTENTS: Sensor, Batteries, Hardware, Instructions. NOTE: Requires connection to a compatible control panel/receiver (319.5 MHz wireless frequency), such as a GE/Interlogix Panel (NetworX, Simon, etc. ), Qolsys IQ Panel, Leviton 64-Zone Receiver for GE/Interlogix, Elk M1 Wireless Receiver for GE/Interlogix Crystal Transmitters, or other legacy 319.5 MHz system (all sold separately). SPECS: Part Number: QS1230-840. Code Outputs: pairing, tamper, tamper restore, alarm detect motion, alarm restore, supervisory, low battery. Approvals: FCC, IC. Warranty: 1-Year Limited. If you have any questions about this product by QOLSYS, contact us by completing and submitting the form below. If you are looking for a specif part number, please include it with your message.